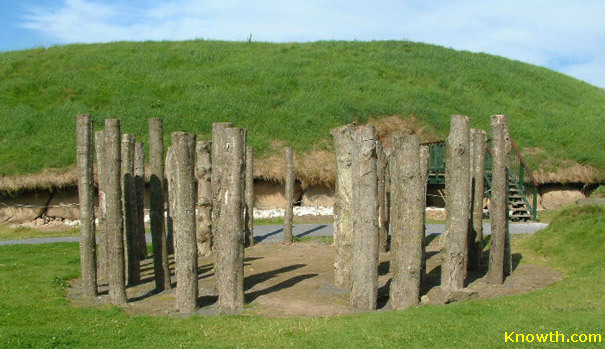 Between 2800BC and 2500BC a timber circle or woodhenge was constructed near the eastern passage entrance at Knowth, the timber circle has been re-created using the 33 prehistoric post holes. This period is known as the Grooved Ware period from a particular type of pottery vessel which had a flat bottom and straight sides. Grooved pottery was found near the timber circle. Votive offerings were also found in and around the Timber Circle suggesting that it was used for ritual purposes, possibly after the Great Mound had fallen into disuse. The Great Mound was built over 5000 years ago, probably after the construction of Newgrange and before the construction of Dowth. The Great Mound at Knowth is similar in size to Newgrange and is surrounded by 18 smaller satellite mounds. The Great Mound has two passages with entrances on opposite sides, the western passage is 34 metres long and the eastern passage is 40 metre long, ending with a cruciform chamber. The eastern passage of the Great Mound at Knowth measures 40 metres, making it the longest megalithic passage in Western Europe. At the end of the passage is a cruciform chamber with a corbelled roof similar in style to Newgrange.